Gabby Sanderson is used to being let down even at Christmas. Which is why she’s happy to skip the festive season completely in favour of a plane ticket and sunnier climes. Owen fancied Gabby from the moment he sees her when she starts working for the sweet company he works at and the feeling is definitely mutual. This book leads you from a few weeks before Christmas up to Christmas Day itself and on the way we learn about Gabby’s insecurities and Owen’s lack of confidence despite his reputation. Will their pasts cause a problem for their future or will Santa bring them their happy ever after. 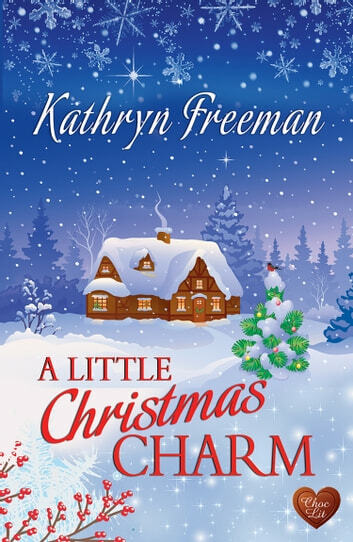 A lovely book to get you into the spirit of Christmas and I love the way Kathryn weaves a Christmas message reminding us of what Christmas is truly about. Great characters that you can empathise with and characters that I genuinely liked and wanted the best for, some fun and laughter, tears and tantrums, this book has it all. I highly recommend this book if you want an enjoyable, easy read. This page turner of a book will light up your journey towards Christmas. Gabby and Owen's relationship starts in the office and is fraught from the start. No only do their histories play a powerful part in thwarting a happy ever after but a returning mother, hospitalised father and problems with the ex all add to the mix. This well written book will keep you entertained and rooting for a happy ending, just be sure to have a supply of chocolate to hand! A warming read for autumn and winter days! Read in large sumptuous chocolatey chunks whilst wishing for Christmas! Just 69 days to go, by the way :) Synopsis Owen Cooper is a totally handsome, suave, outrageous flirt with a reputation. Gabby Sanderson is initially cautious of his charm and keeps him at arms length to protect herself from another let down. Both Gabby and Owen are part of the Sweet Art Christmas Party Planing Team, and with the season on the horizon, it is all systems go. Gabby doesn't have any happy festive memories and usually chooses to spend Christmas in sunnier climes away from the whole pantomime. Could this Christmas be different however? Can Owen charm Gabby into loving Christmas in the same way he’s charmed his way into her life, or is he just another person who’ll end up disappointing her? Review This is my first read of Kathryn's books and I was not disappointed. I really enjoyed Owens efforts with the reticent Gabby, and her slow thaw to the idea of fun at Christmas. It made a change to read about a reluctant female rather than a female wondering if she should pursue a man. I liked that, even if her hesitance is borne out of past history. The added characters in the story are the perfect accompaniment. She has a mother who is wholly absent and his own father is in despair with loneliness and loss since the death of Owens mother. There are PA's who feature and one who surprises and amazes and Owen has a very special bond with a young child from a previous relationship. The whole ensemble serves to delight you as you read along the winding path to Christmas, at each turn wishing for a happy ending, but you are never really sure if there ever will be one. Delivered to my kindle for an honest review as a Star Selector for the fabulous team @choc-lit! This is the story of Gabby, who has serious trust issues from her childhood, and Owen, the suave and charming Sales Director determined to win her. You just know that it won’t be easy…. I wasn’t sure about this one for a while, but as we brought in his father, the daughter of his ex-lover, his older PA, and her mother – well, that’s where it all started to get interesting, and I began to get involved, I did shed a tear or two in places. An enjoyable book – well worth reading.